TRANSLATION:Renée Sporre-Willes in collaboration with Jennifer Mulholland. DATE OF PUBLICATION OF THE VALID ORIGINAL STANDARD: 28.07.2009. BRIEF HISTORICAL SUMMARY : The Norrbottenspitz (Spitz from the county of North Bothnia) probably originates from small Laika type spitz that were known to live with hunting people in the North Cape area already in prehistoric time. Small hunting spitz have survived for thousands of years through natural selection - the survival of the fittest. In the very harsh areas of the northern parts of the Scandinavian Peninsula, hunting for food and fur was a necessity for survival. Precious furs like sable, marten-skin and ermine were the only valid currency for centuries. When fur prices dropped drastically after World War II, so did the interest for the Norrbottenspitz. The breed vanished and had no registrations for many years; hence the Swedish Kennel Club (SKK) declared it extinct. But only a decade later news came that some true to type specimens had been found living as pets and watch dogs on small homesteads in the inland North Bothnia. Due to the very dedicated work of a few men, this old type hunting spitz was saved. In 1967 the Norrbottenspitz was re-introduced to the Registry and a new standard was drawn up. GENERAL APPEARANCE:Small, slightly rectangular spitzdog, well poised, with sinewy and well developed muscles. Alert with head carried high, a fearless attitude and extremely agile. Sexual diphormism should be clearly visible. BEHAVIOUR/TEMPERAMENT : In its capacity as hunting dog the breed should be attentive and bold. It is a keen, lively, self confident dog with a kind disposition. Although the breed is mainly used for hunting large forest grouse (caper-caillie and black grouse) it is still capable of hunting fur game as well as baying elk. HEAD: Strong and clean cut. Seen from above and from sides evenly tapering towards nose. Skull : Relatively broad, forehead is slightly arched, top of skull rather flat. Stop : Evident but only slightly marked. Muzzle : Its length is half the length of the head or somewhat shorter. Clearly tapering towards tip of nose, but never snipy. Lips : Thin, and tightly fitting. Jaws/Teeth : Well developed jaws and teeth, scissors bite. Eyes : Medium sized, almond-shaped and obliquely set. Bright with a calm but keen expression. Colour dark brown. Ears : High set, erect, slightly over medium size, with hard leather, tips slightly rounded. Moderately long, in proportion to body dry and muscular with slight arch and good reach. Back : Short, level, strong, muscular and springy. Croup : Moderately long and broad, slightly sloping and with well developed and hard muscles. Chest : Moderately deep and long. Depth about half the total height at withers and with well developed last ribs. Oval in shape viewed from the front and of normal width. Forechest well developed and well defined. Underline and belly : Viewed from side, the lowest part of the ribcage should be in line with the elbow or just below it and softly merge into the bellyline. Belly only slightly tucked up. Rather high set, carried in a high curve, but loosely curled. Tip of tail touching side of upper thigh. 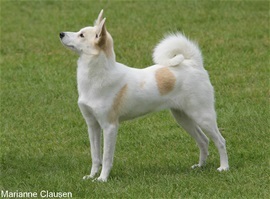 Stretched, the length of the tail should not reach below hock. FOREQUARTERS :Viewed front on, neither narrow nor broad, with legs straight and parallel. Shoulder : Shoulder blades long, broad, muscular and with well developed withers. Close fitting to chest and set obliquely. Upper arm : Of the same length as the shoulder-blades, and forming a marked angle. Well developed and lying close to the chest without restricting movement. Elbow : Neither turning in nor out. Forearm : Straight, strong bones, lean but flexible muscles. Metacarpus (Pastern) : Strong, slightly sloping, viewed from side. Forefeet : Small, strong, pointing straight forward with tightly knit, well arched toes. Well developed and hard pads. HINDQUARTERS :Standing parallel when viewed from behind. Thigh : Proportionately long, almost forming a right angle with the pelvis. Strong muscles. Stifle : Strong with well defined angulations. Lower thigh : Forming a marked angle with the upper thigh. Metatarsus (Rear pastern) : Dry and elastic and rather long. GAIT/MOVEMENT: Smooth, free and covering lots of ground, keeping firm topline. Limbs parallel, viewed from front and rear. Hair: Double coat. Undercoat fine and dense, guardhair hard, short and straight. Topcoat rather close laying with different lengths; shortest on nose bridge, top of skull, ears and front of legs. Longest on neck, backside of thighs and under side of tail. COLOUR: Pure white, always with well defined and well distributed patches with the ideal colour that is in all nuances of red and yellow. Patches on body should be fairly big. Colour should cover the sides of head and ears. Patches in black, any nuance of fawn or agouti are tolerated but the ideal colours are always to be preferred. Height at withers: Ideal size for males: 45 cm. Ideal size for females: 42 cm. FAULTS : Any departure from the foregoing points should be considered a fault and the seriousness with which the fault should be regarded should be in exact proportion to its degree and its effect on the functional health and welfare of the dog and on its ability to perform its traditional work . Flesh coloured or liver brown nose.